The sky is falling again. Davis Guggenheim who enlightened (or depressed us) with the information about the state of our environmental troubles in An Inconvenient Truth now opens the door to the sad state of public education system in the United States. It's been a year since the film premiered at Sundance and won the prestigious Audience Prize for Documentary. It's $6.5million theatrical gross this summer was even more impressive. Now it lands on Blu-Ray without an Oscar nomination to it's credit. The first half hour is a depressing wake-up call, using statistics on literacy and math proficiency to tells us the news that most people already know, that student test scores in many places in the United States are downright awful. Whether it’s the inner cities of poverty-stricked urban centres like Los Angeles or even certain middle-class suburban districts, failure rates are rampant. It’s not entirely whistle blowing information, but Guggenheim's ability to summarize the info in a clear and entertaining manner makes us pay attention. Second act we start to see how and by whom America is taking action - the individuals who are fighting to make a difference. Like Geoffrey Canada an educator in Harlem who developed a new type of charter school, or Michelle Rhee, the controversial Chancellor of the Washington D.C. area. These are angry people looking to make a difference, and their enthusiasm is infectious. Guggenheim comprehensively goes through all the major factors which historically have been obstacles to cleaning up these schools and raising their grades. Money doesn't seem to be the problem as public funding has gone up over the past 20 years. Guggenheim admirably gives weight to all variables, the allocation of funds, the school district bureaucracy, the poverty and financial realities of life in lower class America and even the actual teachers themselves. The most frustrating analysis comes from the teacher's unions, which appears to have the most egregious responsibility for these failures. The inability of the schools to actually fire the bad teachers results in what Guggenheim called the Lemon Dance. Like most unionized industries, what was once a noble effort to fight for the rights on workers has devolved into an outmoded and stubborn myopic institution unwilling to adapt to new realities. For once this is a non-partisan documentary wherein, Republican or Democrat, everyone seems to be fighting on the same team. And though the issues here are important and the stakes high for the individual kids profiled, the documentary suffers from the prosthelitizing which is inevitable with films such as this. An Inconvenient Truth skirted this with the fascinating portrait of Al Gore. 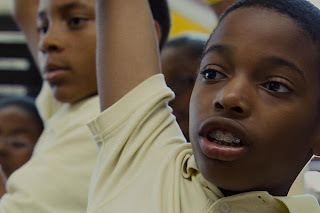 Though we feel the tension of the kids and parents in this film who wait on bated breath for their names to be picked in the charter school lottery system, we don't get to know any of the subjects are intimately as Gore. Waiting For Superman benefits most from Guggenheim's glossy production values and fast pacing which makes a subject, normally drier than toast, as interesting and exciting as possible. And as for the title, it's a very large stretch to connect to the subject matter here.